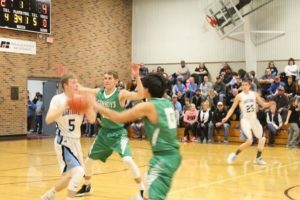 Colome boys basketball team ended the regular season Friday night with a 59-54 victory over Tripp/Delmont-Armour. Layton Thieman led the scoring for Colome with 23 points. Jackson Kinzer added 14 and Calvin Ringing Shield, 13. Kolton Salonen had 8 points. Salonen pulled down 12 rebounds. Ringing Shield had 8 ad Thieman, 7. Thieman had 5 steals. The Cowboys take an 18-2 record into the post season. They played their first regional game on Feb. 27 in Colome.